The above mentioned problem can be resolved utilizing principles of artificial immune system in two modules one for attribute selection and other for scheduling rule selection. 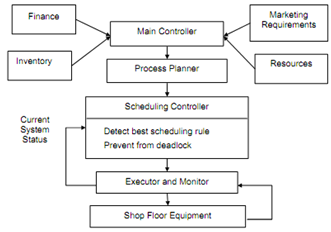 A schematic diagram of the adaptive production control system or APCS is represented in Figure no.1. The AIS-CLONALG methodology is improved for searching the excellent or best dispatching rule for the next scheduling period by employing a hybrid approach whether clonal algorithm and immune system both are designed. Thus, this methodology is able for selecting the dispatching rule, system attributes and can handle the typical scheduling problems. The methodology would offer an optimal system attribute's subset on the basis of presentation criteria. 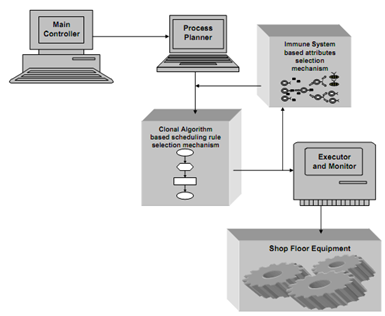 In Figure no.2, the architecture of the adaptive control mechanism for shop floor control is represented. In the aforementioned structural, the major controller governs the entire manufacturing industry upon the basis of marketing requirements, the industry's financial condition, obtainable resources and current inventory in the unit. The marketing needs depend on the customer demands that are highly fluctuating. As per to the above requirements, a process plan is prepared to attain the production object at the optimal cost. The scheduling function is the major function after procedure planning. In such phase we select the best scheduling strategy utilizing the feedback from shop floor. This is utilized for deadlock resolution also. For choosing the optimal or best rule, then we implement the clonal algorithm. This selects the rule upon the basis of every system attributes. This algorithm iterates till the satisfactory result is acquired. For evolving the advanced or superior feature subset of the system attributes, and IS or immune system is devoted. Thus on the basis of the advanced or superior feature subset, CLONALG enhances the best dynamic dispatching rule strategy. Such type of strategy is executed by next control level, the monitor and executer, to the shop floor physical equipments as like machines, AGVs and another component. This control level presents the monitoring functions upon the basis of feedback from shop floor and this gives the feedback of the recent system status also to the scheduler, a hybrid AIS- CLONALG mechanism. Consequently, adaptive production control system or APCS utilizing AIS-CLONALG methodology has the ability of any shop floor control system. This can enhance the performance of the system employing the attribute selection by Immune system or IS.